Bishop Artemio Garbriel Casas, ordained priest on March 20, 1938, started his actual priestly service as Assistant Parish Priest of Paombong, Bulacan and was later transferred to San Roque Church in Rizal, and the Immaculate Conception Parish in Tayuman, Manila. 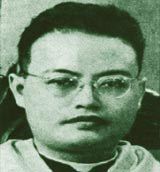 He became Rector of the Manila Cathedral from 1956 to 1962. He was subsequently appointed Bishop of Imus, Cavite, serving the position until 1969. Bishop Casas also served as Chancellor of the Archdiocese of Manila during the term of Manila Archbishop Rufino Cardinal Santos. When Cardinal Santos died, Bishop Casas was appointed Vicar Capitular. Shortly after, he became Archbishop of Jaro, Iloilo, replacing Jaime Cardinal Sin who was named Archbishop of Manila. Bishop Casas was also a Censor Librorum during the Pre-Synod years. He died on March 29, 1989 at the age of 78.